Kurt Schwaen (1909-2007) was an East-German composer, a collaborator of Bertold Brecht at the Berliner Ensemsble in the 1950s and an “official” of East-German music: “Schwaen has held numerous honorary positions, e.g. in the Association of Composers and Musicologists and in the Academy of Arts, to which he was named official member in 1961. 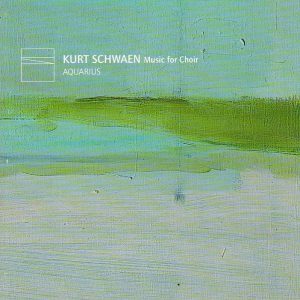 His compositional output, which spans seven and a half decades, contains more than 600 works in every genre, from song and chanson to choral music, piano works, chamber music and orchestral works, and includes opera and works for the ballet.” There’s a website for Schwaen. He said, quoted in the liner notes, that he enjoyed “writing music to folk poetry more than any other genre”. The cycle “Komm wieder zur künftgen Nacht” (tracks 1-8) on 16th century texts is subtitled “Deutsche Volksdichtung” (German folksongs), and that’s how they sound indeed. : folk music, maybe a sophisticated arrangement of folk-music, but not sophisticated modern or contemporary music. Perfect for an amateur choir. “Ein Zicklein” subtitled again “Volksdichtung” (track 10), is slightly more sophisticated, sounding something like one of Orff’s “pedagogical” choruses, but without the distinctive personality. “Schlaf mein Kind” (12), a lullaby, is sweet and mellifluous, very pretty in a Christmas Carol style. 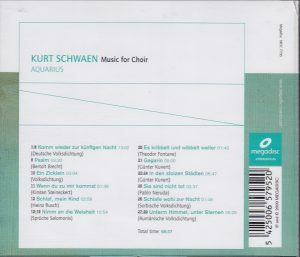 “Wenn du zu mir kommst” (track 11) and “Schlafe wohl zur nacht” (track 26) sound like simple lullabies or folksongs that Brahms could have written or harmonized. Psalm, track 9, (not a psalm, it is the title of a poem of Brecht) and the cycle “Nimm an die Weisheit” (13-19), on proverbs of King Salomon), the cycle “In den stolzen Städten” on poems by Günter Kunert (22-24), “Sie sind nicht tot” (they are not dead) on a poem of Pablo Neruda, and the cycle of four “folk poems” (Volksdichtungen) “Untern Himmel, under Sternen” (tracks 27-30) are harmonically more daring and grating, but they don’t go far beyond Hindemith or Karl-Amadeus Hartmann. The one that sounds most advanced in its harmonic language is Gagarin, track 21, sounding (appropriately to its text about, indeed, the Astronaut, a poem by Günter Kunert) very “Ligeti-space” with the mysterious softness but without the violence, and it comes as no surprise that it the one composition of Schwaen here that starts being interesting. TT 59 minutres, texts of songs given in their original German, no translations. This is of very specialized interest: collectors of music from East-Germany perhaps, or those looking for compositions suitable for amateur choirs. Megadisc was an interesting label, established in the early 1990s, that brought to the listener’s attention little-exposed Belgian composers and composers from the ex-Soviet area, starting with Shostakovich’s maverick student Galina Ustvolskaya. A new management took over a short time ago and obviously they don’t have the intention of keeping this one in their catalog: they’ve attributed the same catalog number, MDC 7795, to another release, Christian Zanesi’s Paysage électronique avec train (2015), barcode 9780201379655, more about that one on Megadisc’s website. Can’t entirely blame them.